Yes, I know that he is a scarecrow. But I still would. 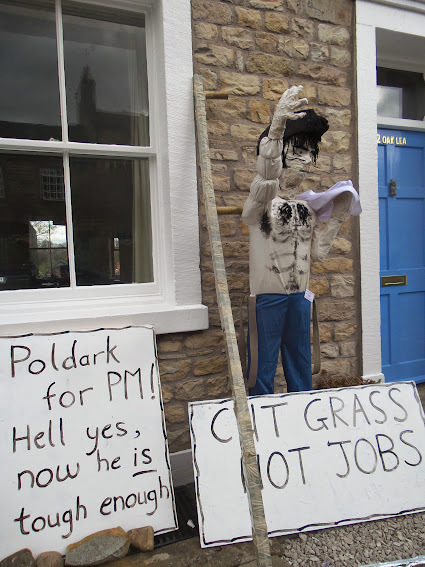 This time a scarecrow is doing a straw poll (sorry) to see which way people are planning to vote in next week’s elections. I hate the fact the faded blue child’s ballpit balls overflowing in the Conservative tub might actually have some actual impact in my actual real life scarecrowless life. A sentence I should not have to ever say. I have a urge to wee in the Ukip tub and then watch them bob all around in a sea of wee but refrain. Only two people in Wray vote Labour. This so beats a swingometer. 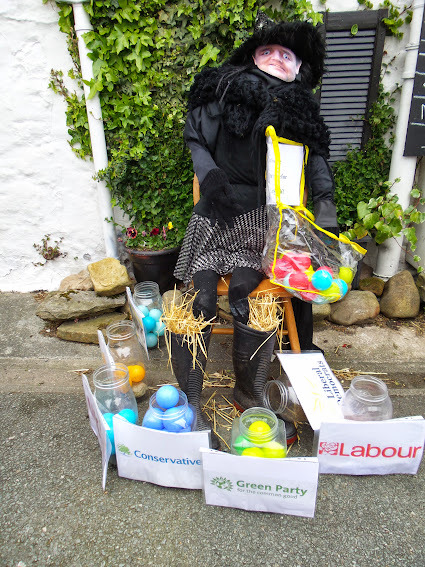 I wish all voting was done with plastic balls at Scarecrow Festivals. It would make Newsnight far more colourful. 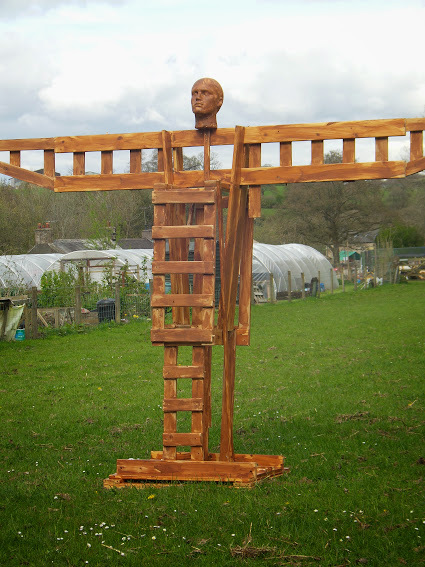 I don’t know what this Angel of the North is meant to represent. 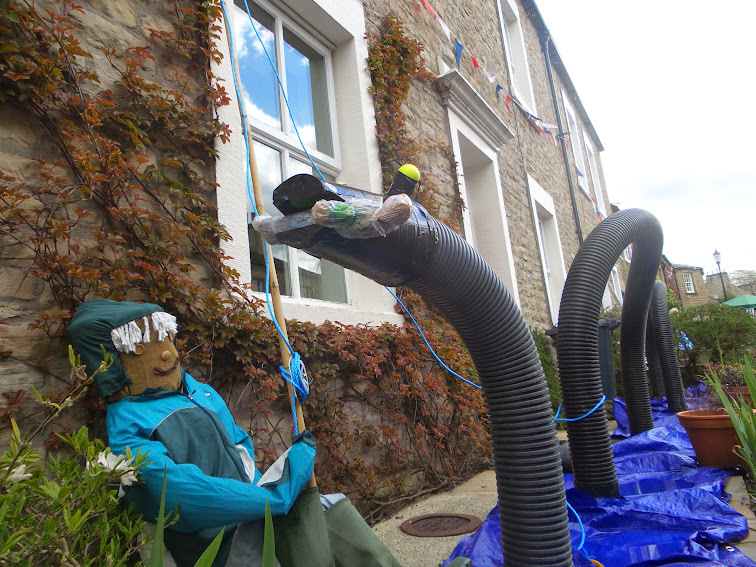 I like to think the people who made it are aloof and alone- possibly the Barclay Brothers and people are scared of them and the sinister message the scarecrow is somehow conveying to the village and the village’s children and the villagers’ childrens’ children. 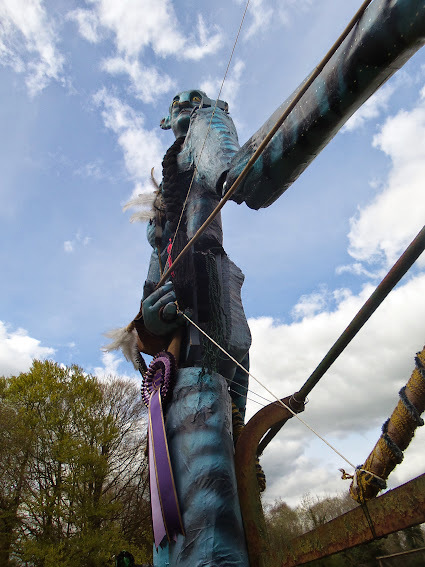 The theme this year was ‘fantasy’ and this animatronic scarecrow diorama shows a man actually ironing and holding a child. Sorry, suffragettes. It is fantastic of course. 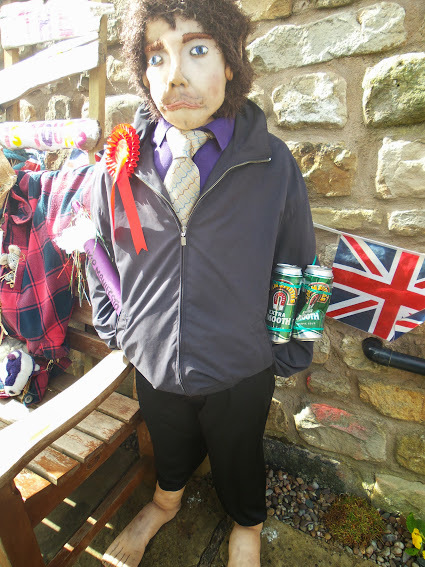 I have however got to the stage where I am eyeballing scarecrows to work out the creator’s political persuasions in the hope I can discover the two Labour voters in the village. This is not one of them. 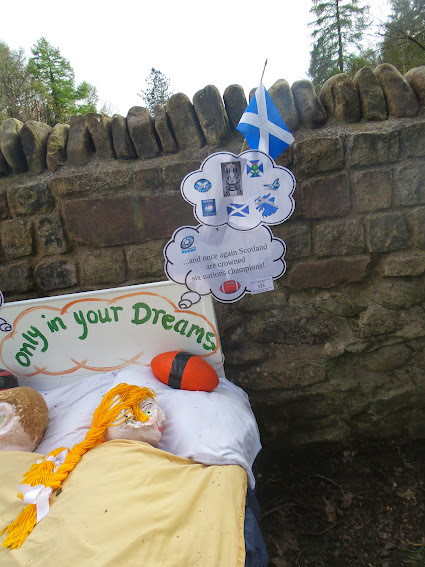 There was a similar Scottish/ anti- Scottish themed scarecrow in this pleasant little nook by the river last time. 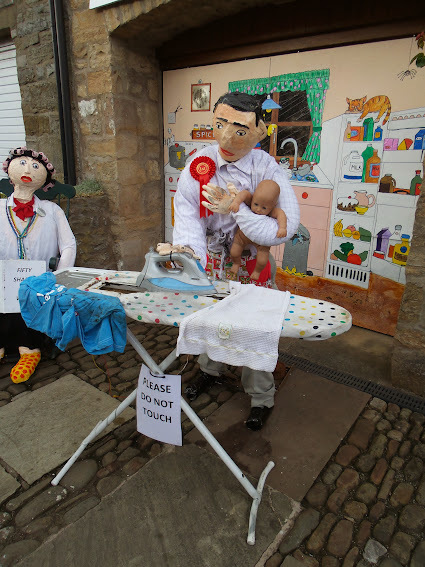 I like to think it is an embittered husband and wife (one of whom is Scottish) with different political persuasions fighting each other through the medium of Scarecrow. This is just the real Nigel Farage. I hope the real Nicola doesn’t see this. No, THIS is just the real Nigel Farage. It’s made even better by the slight suspicion that Nigel Farage is made out of last years Bilbo Baggin’s scarecrow. And look at his toes! His toes are terrifying and I see them at night sometimes in the dark. 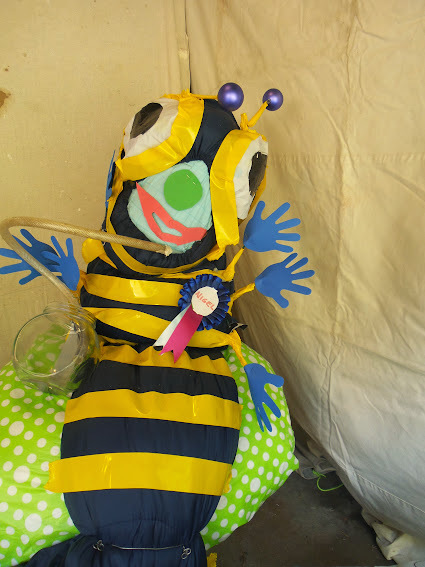 This entry was posted on Saturday, May 2nd, 2015 at 9:05 pmand is filed under . You can follow any responses to this entry through the RSS 2.0 feed. You can leave a response, or trackback from your own site. 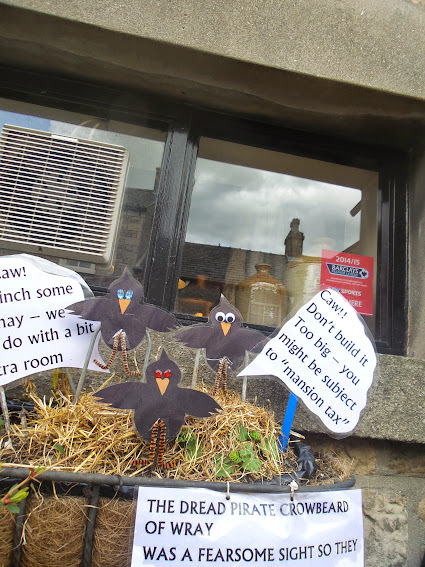 Always look forward to your Scarecrow Festival posts. Please move to Wray, we’re not all self-serving Tory knobs. 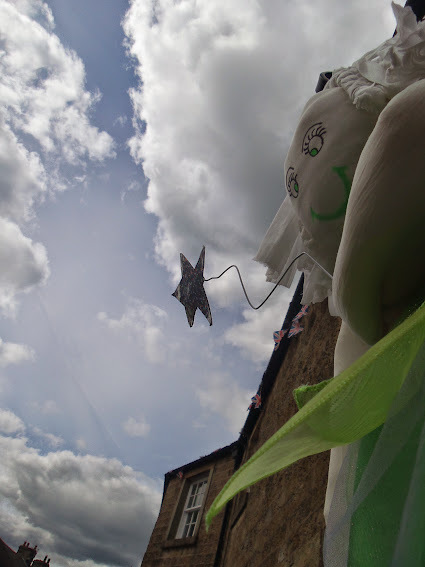 But I think there are only three people in the village who like good music and one of those is our five year old son who rocks it out at maypole dancing. Actually there’s also the cool 19 year olds who look like they’ve stepped out of a dark French movie and have Purity Ring and Joy Division blasting out of their parents’ beautiful and enormous house while they’re away. But they wisely veer away from friendship with people of nearly 40 who still wear converse in a desperate attempt to retain youthful cool. I would totally move to Wray if I could afford it. 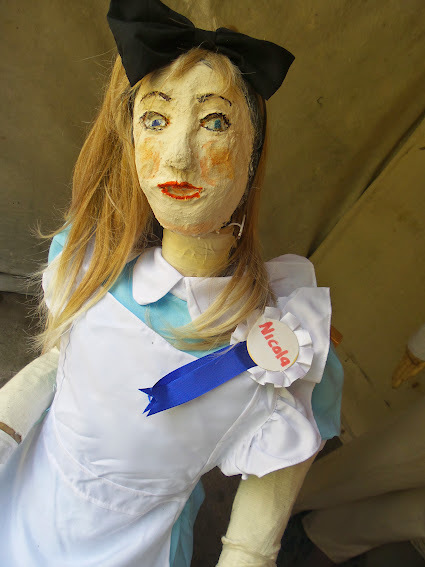 I dream of making gloriously inappropriate scarecrows that women will drag their children past very quickly. I used to love maypole dancing- sadly my dyspraxia led to several children being stuck in the ribbony mesh for a prolonged period of time. I am also a big fan of Purity Ring and wear dresses with fairies on despite being 36. 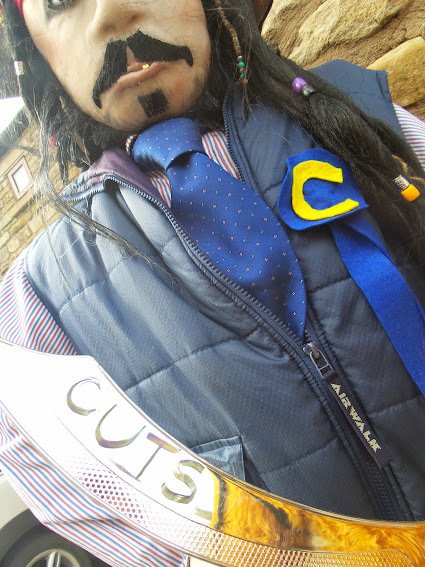 I never had any youthful cool to retain but fear I might be starting to resemble Vivienne Westwood.